Crazy Glue is the brand name for an ultra-strong adhesive used to bond nearly any two surfaces imaginable. The glue typically has a fast drying and curing time and, once hardened, it forms a cement-like bond. Crazy Glue does its job well, but a mistaken spill or a few misplaced drops of it can pose a problem. The glue is removable from most any surface, including the teeth of a metal zipper, using household materials. 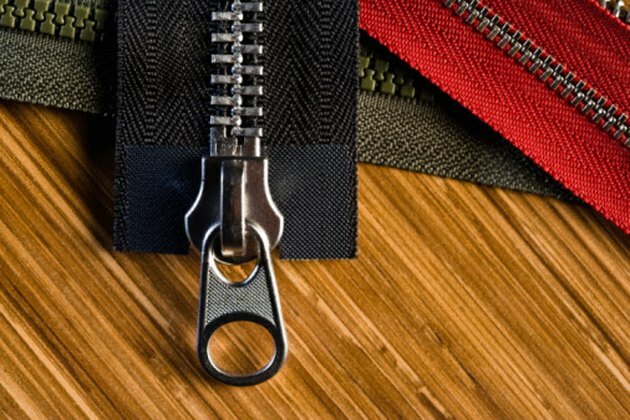 Dried glue can keep zippers from opening and closing. Dip an old toothbrush into a container of acetone nail-polish remover. Brush the acetone over the glued areas of the zipper. If the glue has seeped between the zipper's teeth, gently work the bristles of the brush into the crevices. Place a moist paper towel over the zipper to prevent the acetone from evaporating. Allow the acetone to permeate the glue and loosen its bond for 30 minutes to an hour. Scrape off the fragments of glue using the blade of a plastic knife. Open and close the zipper several times until it moves smoothly up and down the teeth. Wipe off any excess acetone with a clean cloth.